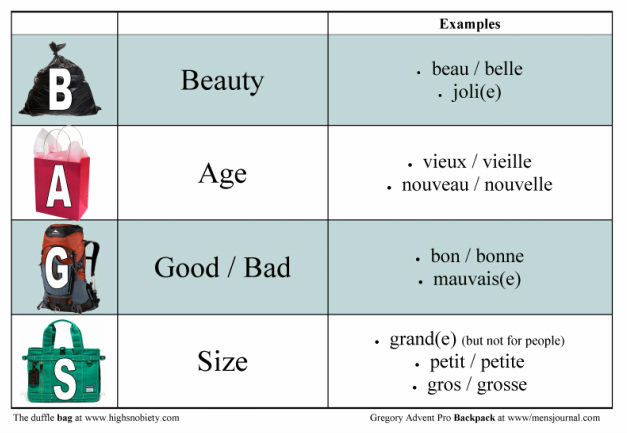 In French, Adjectives have to match the noun they are describing in both gender (masculine and feminine) and number (singular and plural). It is, therefore, very important that you recognize the various ways you can write them. This is explained a bit further under the following table of basic adjectives. Nationalities are not capitalized in French. Most adjectives have a masculine and feminine version. The feminine version has either been written out fully or is simply made by adding the "e" in brackets. Pluralizing an adjective is usually just a case of adding an "s". Colours are, of course, also adjectives as they describe. It is important to note that in French, the colour goes after the word it describes. 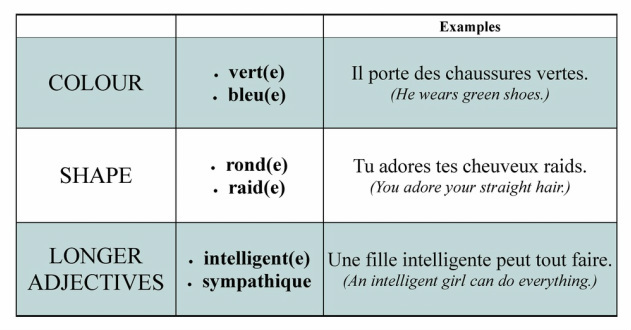 The words "claire" and "foncé(e) can be used with any colour. I have used "bleu" to illustrate how to use them. In English, adjective go before the noun. End of story. In French, some go in front, some go behind. Figures right? Here is a way to remember. The adjectives that go in front of a noun are the most commonly used adjectives and can be remembered using the acronym "BAGS". Elle a un beau jardin. Nous sommes des bons élèves. Un grand appartement est difficile à trouver. In all reality, most French adjectives go after the noun. It's just that the ones that make up "BAGS" are the most (over) used ones. It is also important to note that some adjectives can be found both before and after the noun but that their placement changes their meaning.